Is clicking Selfies a mental disorder? Did you participate in a Selfie Initative at Work? 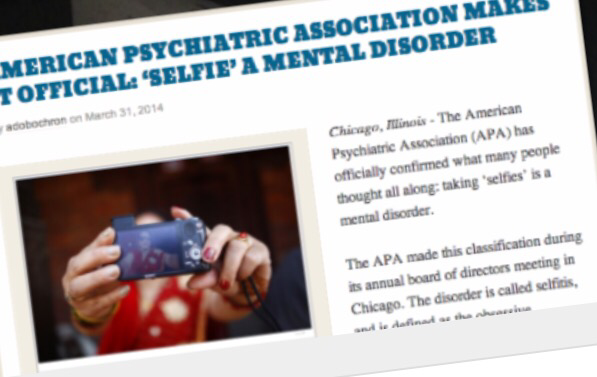 In March 2014, the news about the American Paychiatric Association declaring selfie obsession as mental disorder went viral. Thanks to the advent of social media, there were millions if not zillions of shares, comments and discussions threads on and of this news. Those who didn’t believe in selfies seemed over joyed and felt a strong sense of endorsement for their thinking and feeling by the APA. Those who love clicking and sharing selfies were taken aback and probably some of them might have seriously doubted their style of expression, whilst some must have just shrugged of the news as sheer nonsense, but for sure it must have made a lot of people think, debate and discuss this. Then very soon or very late (by Apri/May 2014) it was revealed that the news quoting APA was a hoax, it was a fictional spoof by Adobo Chronicles (A parody website). And bang! The said debate and discussion becomes even more interesting. I observed that people of younger age group (below 30) found this news to be bizzare if not absurd and most of them accepted that they click and share selfies and also own a selfie stick, which is their travel companion. People in the middle age group (30 to 45) were on the fence, most accepted the fact that they click and share selfies but also qualified that they take more group selfies vs individual selfies. People in the age group of 45 and above (my age group) were most cynical and sarcastic about the selfie phenomena, however some people were absolutely okay with group selfies and felt as long as it isn’t an obsession and just pictures of oneself, selfies are okay. One person also said that he takes selfies only when he doesn’t find someone else to click his or his mates pictures. When asked to define obsession, most people defined it as overdoing it (high volume shares). Also when asked to define a selfie, almost everyone said that a group selfie (more than two) isn’t really a selfie. They define selfie as a picture taken by self of oneself or two people together – the definition is almost correct. Selfie is best defined as a Self Portrait clicked by self using your own mobile phone camera. This made me wonder if the thinking, feelings and opinions on the subject are based on age or generational diversity? Does it have to do more with access to and proficiency in technology (use of phone cameras and social media)? I didn’t find anything that suggests that that there is any gender sensitivity in this subject. Most blogs and articles (that I read) about the psychology behind this, suggest that clicking selfies and sharing them on social media is an individual or personal style and choice of expression. Its similar to fashion (kind of clothes you choose to wear), hairstyle, blogging, movies you watch or books you read, etc. I think the debate on selfie obsession (overdoing it) will continue and the jury is still out on this one. Some say that it’s the new form of narcissism, to me it’s a new style of expression using the new tech platforms of good phone cameras and the advent of the social media. The article on this subject in the Forbes also suggest that human beings by nature seek recognition and positive strokes. Some may seek it more as opposed to others. The style and way they seek it is a matter of individual’s choice and need. Am attaching a few links to related articles, they helped me understand the psychology behind the selfie phenomena and of course, I will always refrain from passing any kind of value judgement, such as, its an obsession or an disorder – each to his own and all respect for the choices people make about expressing themselves. My two cents worth – to all leaders and people managers out their, try and understand the psychology and reasons behind people behaviour and once you understand and respect them, you will be able to shape, guide, engage and leverage them. If you participated or started a selfie sharing initiative in your company, as long as it is not a mere self portrait, is more inclusive and is aimed at recognising people and allows freedom of expression, its not a mental disorder. This entry was posted in Uncategorized by Yashwant Mahadik. Bookmark the permalink.